I like Kickstarter a lot. It's an efficient way to directly connect with artists while also making sure that a project that interests you gets funded. There are still a few hitches that need to be worked out, but my experience with Kickstarter has been largely positive. I've backed eleven projects across a variety of genres, and the results have been solid, for the most part. Over the coming weeks, I'm going to take a close look at some of them, examining the positive and negative aspects of each campaign. 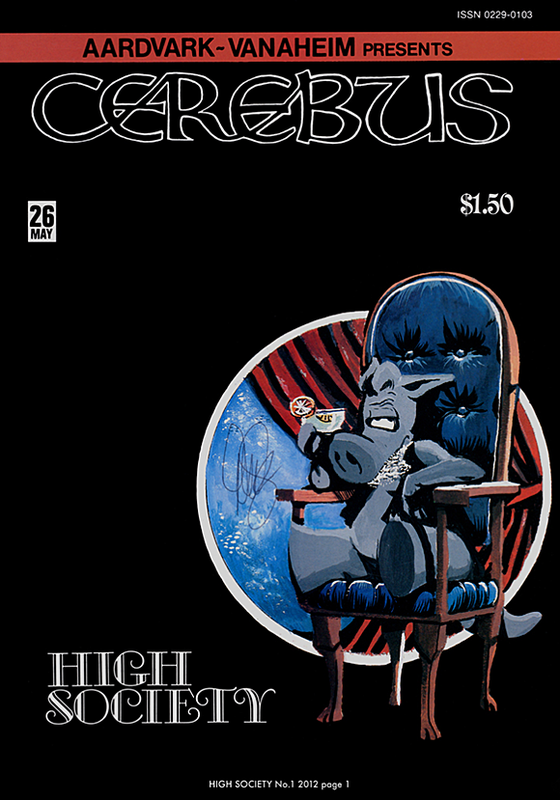 Today, I'm looking at CEREBUS: High Society - Special Audio/Visual Digital Edition, a project meant to translate Dave Sim's magnum opus Cerebus into a digital format. Dave Sim's Cerebus is one of those classic comics I've never read. I've seen the character between the pages of Spawn and Teenage Mutant Ninja Turtles, but I've never read all three hundred issues of the series before. The sometimes grudging respect it gets from critics make me feel like it's the sort of series I should have read by now, and definitely need to read, if only to see how Dave Sim and Gerhard, his background artist, worked and evolved together. It's part guilt out of ignorance and part genuine curiosity. I'm big into comics art, and everything I've seen from Sim suggests that he's one of those guys whose work I need to know well. The problem is that you can only buy Cerebus in big phonebooks, all three hundred issues of it, and that's a hefty spacial and monetary investment just to check someone out. I've had friends tell me that he starts off very rough near the beginning, too, so I was fine appreciating Sim's work by flipping through glamourpuss every few months rather than diving in. The Kickstarter changed that. It gave me a chance to check out one of the best-received arcs of Cerebus for cheap, in addition to it being in my preferred format: digital comics. 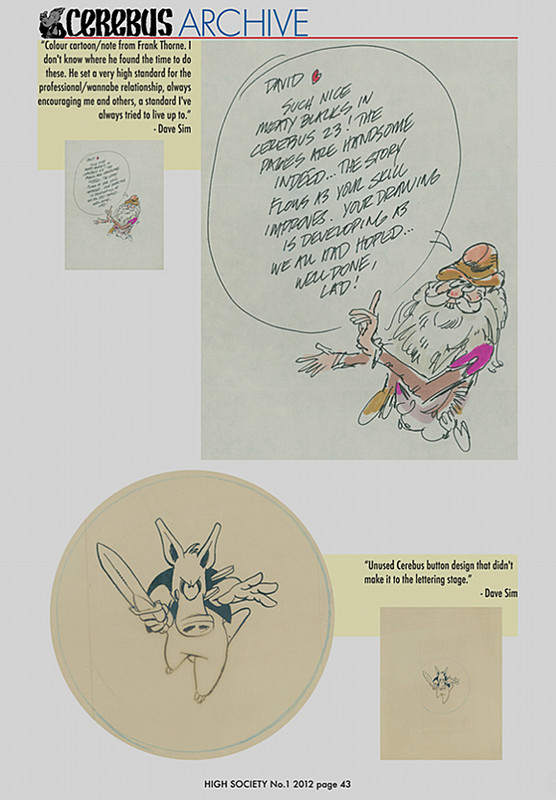 The "CEREBUS: High Society - Special Audio/Visual Digital Edition" Kickstarter was an unexpected roller coaster, compared to a few other projects. It was a little baffling at first. "Audio/Visual Digital Edition" is a strange format for a comic book, and the promise that the project was going to "[turn] the World's Longest Graphic Novel into the World's Longest Audio Book" was confusing. Is it going to be a digital comic or motion comic or what? The description mentions books being made available as a $0.99 digital download and voice acting and and and... man. The rewards make what you get for backing the project a little more clear. For $15, you get a "free copy of the entire High Society Audio/Visual Book in Digital Format." That sounded both easy and exactly like what I was hoping to get. At the time I'm writing this, there are 122 updates -- messages from the project creator to the backers -- for this Kickstarter. It has been around 150 days since the beginning of the project. That's a ton of updates for a single project. It felt like a firehose of information. Some of them are excited updates about meeting the goal, which happened in a matter of hours. 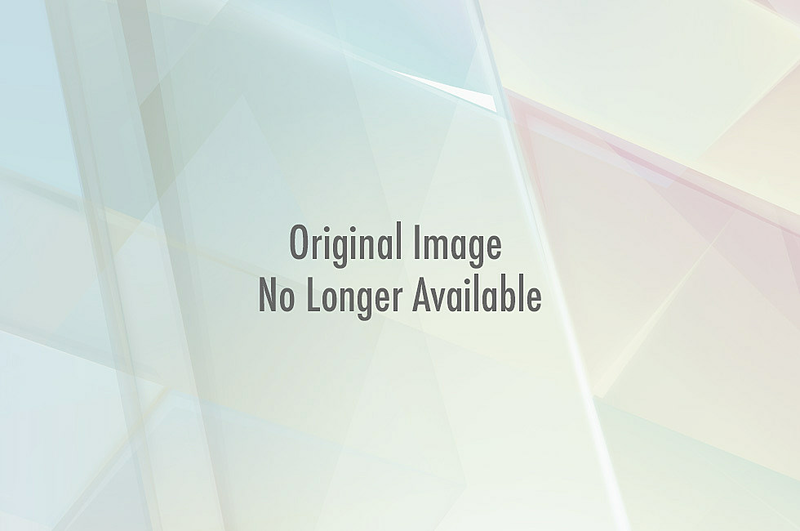 Others are logistical updates, such as who was doing what aspect of the digital editions. Still others were about finding original art to scan for the digital editions, so that they'd be of the highest quality. It's neat to see how that works, but it's also overwhelming. It feels like information overload. I turned the updates off after two weeks. I backed the project and figured that they'd work it out. 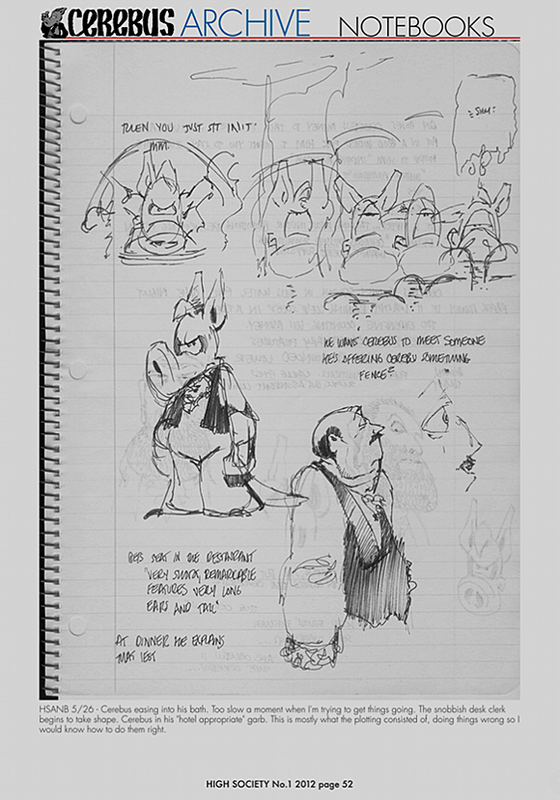 On October 9th, a few months after the end of the Kickstarter and a few unavoidable complications, I got an email to the first chapter of Cerebus: High Society. Which is great, as far as turnaround time goes. But, I realize that I must've misread the Kickstarter. I'd thought they were going to give backers the entire book, issues #25 through 50 of the Cerebus comic, and then serialize it for non-backers. Or something like that? "Graphic Novel" and "Audio Book" are singular, but then there's the reference to "every digital issue," something that definitely implies serialization. I found an early update that talked about a revised launch plan for non-backers that would be serialized, which suggests non-serialization for backers, or at least receiving issues in chunks, rather than singly. Information overload, meet a lack of clarity. I read a lot the night High Society #1 was emailed to me, and I couldn't come up with a clear answer. Others I spoke with on Twitter and via email were similarly surprised and confused, particularly Tom Spurgeon of Comics Reporter. We'd all misread the project, essentially, which was a little frustrating. 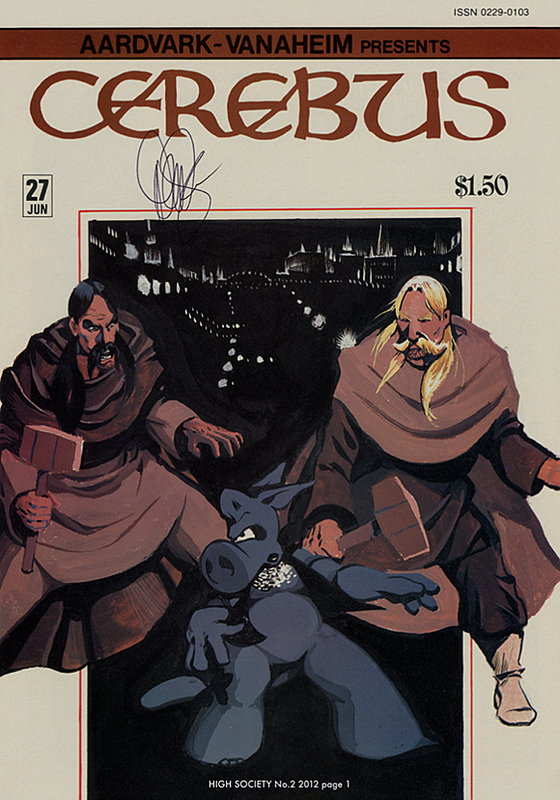 But, okay, sure, serialized Cerebus. We can do this. High Society #1 weighed in at 175 megabytes for a downloadable cbz. That's enormous for a comic book, even one with a ton of bonus material. Full-size comics tend to come in around the neighborhood of 15 megs and most OGNs I've read have been under 100 megs. High Society are hi-res scans at a print-ready resolution, 2100x3000 and 300dpi. That's great, in terms of quality, but overkill for a book you're meant to read. My MacBook, which is less than a couple of years old, crawls when I attempt to open the first issue. I eventually unpacked the cbz, took to Photoshop, dropped the resolution to something more readable and came up with a 29mb cbz. That's much more reasonable, though still a little on the high side for a black and white comic, but great for iPad reading. That just revealed another problem. At full size, and assuming a standard file size of 175 megs, the entirety of High Society is going to run you 4.3 gigs. That's a little smaller than a standard single-layer DVD, but a significant chunk of any tablet's storage. If you're going to read Cerebus: High Society in one sitting (or as one story), you've got to keep on top of your hard drive space. It's clunky and too large for what it is. Additionally, each issue comes with a significant amount of bonus material, which is cool at first. 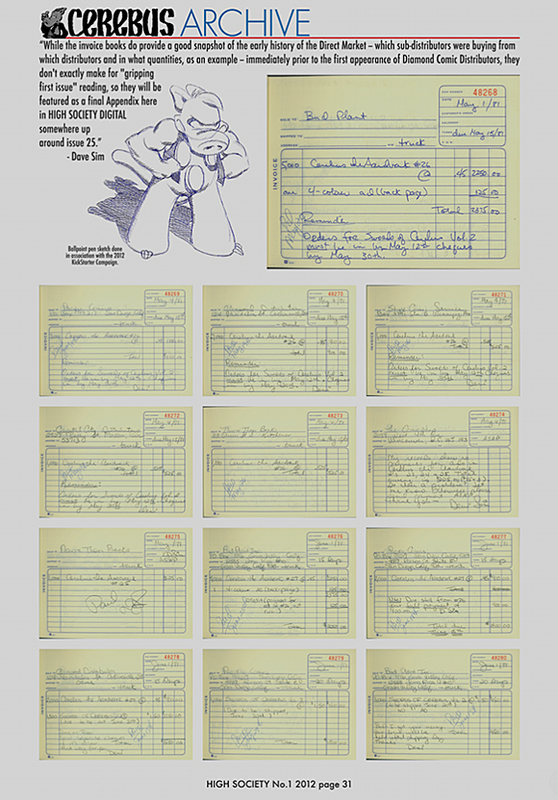 The bonus material for High Society runs from page 30 to page 66, and opens with six pages of invoices before transitioning to a variety of notebook scans, letters, and correspondence with printers and distributors. It's interesting, but if you're trying to read the story without finding out about how printing worked in the early '80s, you're going to have to skip over half of each comic. It makes for a crap reading experience, as material that's best suited for the back of a book instead appears after every chapter. I can't help but feel like this project was missing a crucial quality assurance step. I'll cop to misreading the Kickstarter's rewards, but considering the sheer volume of information and unclear and contradictory explanations, I don't think you can really blame me for being surprised at the serialization. Either way, the enormous file size is better suited for archival purposes than actual reading, and it's annoying to think that it'll take half a year just to finish this one story that has been finished for decades. Clarity is crucial. I'm not a dummy, and I was still confused by what I got. When I went back to figure out whether I'd made a mistake, I couldn't tell one way or another. A simple statement, a "this is a 25 week project" in plain text, would've gone a long way and been much more clear than rewards that state you get "the entire book." Those are two entirely different things, you know? "CEREBUS: High Society - Special Audio/Visual Digital Edition" was a runaway success as far as Kickstarter goes. They asked for $6000 and got $63634. That's a great bonus, and shows the dedication of Cerebus and Dave Sim fans. I don't regret backing this project at all, but I do wish they'd been a bit more clear in what we were getting for backing it. I look forward to reading Cerebus: High Society in a digital format when it's done some time next year. I enjoyed the first issue, but weekly is not how I was looking to read this project. I wanted to sit down and knock it out so I could really see what the fuss was. As is, I've got to wait to see what the deal is, and I'm going to have to decrease the resolution of the comics before I can even comfortably read it. That's such a weird problem to have, and the sort of thing that should've been caught during the quality assurance process. If you're delivering product to consumers, it needs to be usable by those consumers without fooling around with it. I feel bummed out about this project, and I'd be lying if I said I wasn't feeling the same way about the comic itself.